My husband only had a few (yet very specific) requests for his 30th Birthday–that we host the party in our home and that pies were served instead of cake. Being the crafty wife that I am, I set out to create some special touches to commemorate his 30th birthday. Of course, Pinterest was a major source of all these ideas. I designed a special invite for him, playing on a beer theme. They came out plenty masculine yet fun, including matching envelopes. Not only do they incorporate our family name but his birth year and hometown (and that’s Brazil, Ind.–not the country). It’s typical for our group of friends to always pitch-in at each others gatherings (a huge help to the wallet and stress levels). We made a list of his favorite appetizers made by our friends and wrote the request on a little card that was included in the invite, reading, “In lieu of a gift, please bring…” Some also requested a chilled 6-pack of beer or wine too. This system worked out perfectly for our party–thank goodness we have such gracious friends! Inside the front door was the guestbook and photo display of the guest-of-honor. The photos were strung on twine along mirrors and clipped on with mini clothespins. They were arranged in groups with fun labels, such as the one referring to his fascination with statues made apparent while gathering photos! The guestbook was just a simple 8″x8″ blank album that featured prompts for birthday wishes, such as “Your funniest memory of Lance…” It also contained mini envelopes, and I asked his closest friends and family to write more personal letters ahead of time to bring to the party–that way guests would have time to write more heartfelt wishes than just the typical birthday greetings. After the party, I filled in blank spots by using up some of the leftover photos. To make a big impact, I purchased crepe paper folds and produced tons of fringe garlands that were draped all over the party. I followed the tutorial from Oh Happy Day and couldn’t be more thrilled with how they turned out. We had additional tables and chairs spill out into the garage. We also set up beverage bars out there, including Captain and Coke complete with lime wedges and instructions featuring an appropriate photo of Lance. My favorite were some blue plastic wine glasses we purchased–what a cute affordable way to add more color! The fireplace included a special banner I quickly printed and cutout. Simple to put together, yet with a large impact! Two weeks before the party I followed this tutorial for growing wheatgrass to use in the centerpieces. It was super easy to grow, and we had so much that we were able to fill all our outdoor pots too, allowing us to continue the decor outdoors. I wanted the centerpieces to be interactive, so I created floral picks that featured fun trivia facts about Lance. They featured fun experiences that friends may never have heard before, some encouraging further conversation, including, “Ask Lance whose names he has tattooed on his leg.” These worked out great and gave everyone a chance to get to know him better. For the table runners, I used butcher paper and a chevron stencil to paint teal stripes. This. took. forever. I ended up cutting way back after realizing how much time the stenciling was taking. I got away with fairly small pieces underneath the centerpieces, so it worked out just fine. Though I love the handmade look, I’d recommend just buying chevron fabric to use in the future. The dessert table should always be a main focus at a home party. The day before, I invited the girls over for a mini pie-making party, and there’s no way I’d ever have been able to make those pies on my own. (And don’t tell Lance, but I think they had more fun making pies than at the actual party!) We pre-scooped vanilla ice cream into candy cups with mini spoons–a trick I highly recommend for all parties! It was a cinch to grab the trays out of the freezer and add to the dessert table. For the backdrop, I took more of the crepe paper folds and created a rough chevron design in an empty frame. The party was a hit and came together with a little help from the family. Most importantly, my husband enjoyed every bit, including the left over pies he got to eat for weeks! 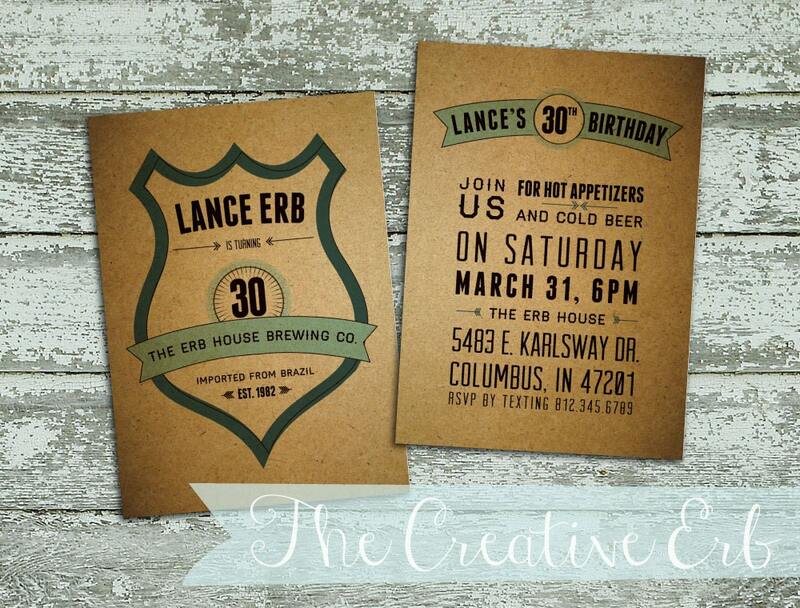 Custom Beer Invitations Now Available! Guess what? You can order your own manly beer-themed party invitations like the ones above on my Etsy Store. Oh I just love all of the details for this party! Everything turned out lovely. I am sad to say my 30th is just around the corner (ack!) and I’d love to do something fun like this! This theme has drawn a lot of interest! You gotta hit the big 3-0 in style!